Marine diesel engines are built to last the life of the vessel. Typically they can be life-extended and remanufactured well beyond the life of the vessel. There is both an environmental and economic case to be made for repowering marine vessels with modern low-emission engines, driven in part by improved brake specific fuel consumption, lower overall life cycle operating costs and reduced engine exhaust emissions. As diesel fuel prices rise, the economics become even more favorable for repowering a vessel with newer more efficient engines. Diesel engine exhaust primary pollutants of concern are oxides of nitrogen (NOx) and particulate matter (PM). These pollutants are harmful to public health and the environment. 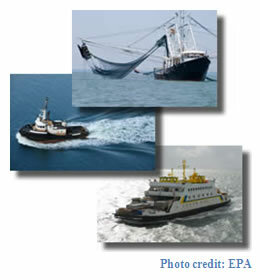 EPA has adopted a three-pronged approach for marine engines that will eventually result in emission reductions. The EPA approach includes 1) cleaner ULSD fuel in 2012, which will improve emissions from all existing engines; 2) certified low-emission engines for new marine vessels; and 3) certified rebuild kits for existing marine diesel engines greater than 600 kW. The vessel operates in and around population-dense areas with poor air quality. Repowering the "average" 3,000 HP marine vessel will yield about 4 tons of PM emission reductions per year. When compared to diesel retrofit programs (i.e., installation of DOCs and DPFs while maintaining the existing engine), it would take about 20 locomotives, 100 to 200 pieces of construction equipment or 200 to 400 trucks to achieve the same environmental benefit of 4 tons of PM reduced per year*. It is important to note that actual tons of emissions reduced are only one part of the equation; proximity to sensitive populations being the second. Taken in aggregate, marine vessel repowers represent one of the best investments in air quality that can be made today. The good news for vessel owners is that in many cases, new modern diesel engines are not only cleaner from an emission standpoint but are also highly turbocharged and more fuel efficient, resulting in lower annual fuel costs, improved oil drain intervals and in many cases less frequent maintenance and rebuild intervals. The operational savings will ultimately translate into a return on investment (ROI) that over time will pay for the new engines. In most instances the ROI is in the 10 to 20 year range, stretching perhaps to as little as 7 years if the application has both high fuel consumption and high fuel costs. There are a few metrics to consider when contemplating whether a repower makes good economic sense as well as good environmental sense. Certainly the new engine will be cleaner, but like ROI, the environmental return ($/ton of pollution reduced) needs to be cost-effective. As a rule of thumb, engine repowers only make good economic and environmental sense if the fuel consumption is greater than 100 gallons of fuel annually for each hp of installed engine capacity. For example a 3,000 hp vessel would generally need to have an annual fuel consumption of 300,000 gallons per year or greater in order for a modest (i.e. 10%) fuel efficiency improvement to have a reasonable chance of generating an acceptable ROI. The second step is to determine whether your existing engines may be regulated under new EPA rules (40 CFR 1042). This rule does not require repowering, but it may increase the maintenance costs of older engines, making repowering look more economically favorable. EPA defines remanufacture as replacement of all cylinder liners, either in one event or over a five-year period. Vessel owners/operators and engine rebuilders who remanufacture those engines would be required to use a certified remanufacture system when an engine is remanufactured if such a certified system is available; if there is no certified kit, there is no requirement until the time of the next remanufacture event. The program applies to engines with maximum engine power greater than 600 kW and manufactured in 1973 or later, through Tier 2 (2012-14, depending on engine size). A certified marine remanufacture system must achieve a 25 percent reduction in PM emissions compared to the engine's measured baseline emissions level without increasing NOX emissions. Additionally, carbon dioxide (CO2) emissions reductions can be calculated if the difference in annual fuel consumption before and after the repower is known. Combustion of 1 gallon of diesel fuel results in 22.2 lbs of CO2 emitted. For example, if the annual fuel savings expected by the repower is 5,000 gallons, the CO2 emissions avoided will be 111,000 lbs or roughly 55 tons annually. The fourth step for a repower analysis is to get a complete picture of the repower process, including the cost of all parts, labor, and professional services required to complete the effort. Parts may include not only the new EPA compliant engine but may also include gearboxes, structural foundations, cooling system upgrades, exhaust system upgrades, engine electronics and an upgraded fuel system components. Labor items include dry dock or yard time, cutting access holes, crane and rigging services, shore power during repower, bilge cleaning, engine installation and alignment, cooling and exhaust system pipe fitting, electronic controls and wiring installation, fabrication of new foundations for main engines and gearboxes and finally sea trials and commissioning. Professional services may include those of a marine architect to prepare a set of plans. Once these costs are determined, an actual capital expenditure budget can be assembled and compared to the expected operational savings so that a baseline ROI can be determined. Note that fuel prices have a significant impact on ROI. The final step is to look for grant opportunities if the repower ROI is in excess of 7 years. If the ROI is less than 7 years, the repower would likely make sense from a purely economic standpoint. Federal grants maybe available to offset the cost of the repower, however these grant programs are highly competitive and consider the environmental benefit as well as cost-effectiveness of the project. Repowering vessels with new low-emission engines will not only improve the environment but will help put money in your pocket.